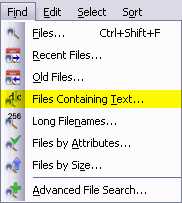 Select Find | File Containing Text... or (Alt+I,T) from the main menu to open the dialog where you can specify exactly which files you want to find. Then enter the type of search and the text or pattern you want to find. In the above example FileBoss will find all htm and html files in the Hamlet and Macbeth folders on drive S for for sooth. Hint: You can limit your search (and thus speed it up and make its results more meaningful) by specifying one or more folders to search instead of just a whole drive. You can also, in the Patterns field, specify only certain files to search file such as *.doc ; *.jpg ; *.jpeg ; *.html ; *.htm. finds files with the exact text (except for white space) you specify, with optional case matching. All white space is treated the same and multiple white space characters are treated as one. Normal Searching allows the use of the question mark (?) and asterisk (*) to match one and one or more characters respectively. All white space is treated the same and multiple white space characters are treated as one. RegEx mode uses a basic set of Unix style regular expressions. FileBoss will search for text correctly in DLLs, EXE and other binary file types as well as in text and document files. *.doc | *.rtf would check only files with names ending in doc or rtf. -*.bak | -*.tmp | -~* search for all files except those that have the extension bak, tmp or that start with the tilde character. The results of the search are put into a File Set so that the found files can be manipulated individually, in groups or all together (copy, rename, delete, move and more). So the search can be used over and over again.